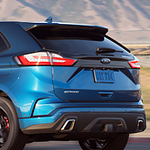 The 2019 Ford Edge ST can Perform Startlingly Well | Rhinebeck Ford Inc. The 2019 Ford Edge SUV brings plenty of performance to the table with a beefy 335 hp Eco-boost motor. This 2.7 L motor provides V-6 power backed up by proprietary power boosting turbochargers. These and other internal components help this vehicle to develop a hill conquering 380 foot-pounds of torque. Fords 2019 Edge ST makes it easy for drivers to handle the copious power provided by the motor. Now, drivers don't have to reach for awkward shifting levers. The 2019 Edge ST provides easy-to-use paddle and cluster shifters right on the steering wheel. This allows drivers to keep their hands on the wheel during high-performance maneuvers. Drivers can also use the paddle shifters in the Edge ST Sports performance mode. Among other things, this special service can allow gears to wind out to higher RPMs before shifts, thus maximizing takeoffs and high-speed accelerations.